Often, medics in remote areas are confronted with a major challenge. Some of these challenges relate to wilderness exposure, or perhaps, an accident while performing activities of daily survival. Give me an axe and set me to chopping wood and you’ll probably see what I mean. Sometimes the challenge faced by the medic isn’t from some external trauma, but internal; problems so severe that, even in normal times, there are limits to the options available for treatment. One issue that fits this description is the Cerebro-Vascular Accident (CVA), also known as a “stroke”. 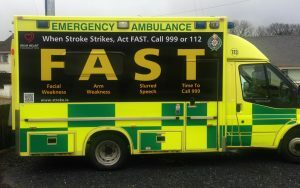 Although modern medicine can do more for stroke victims than the pioneer medic, it’s important for an off-grid healthcare provider to recognize the signs and symptoms of a stroke and to act quickly to improve a victim’s chances of survival. A CVA, or stroke, is a medical event in which a blood vessel that supplies the brain with oxygen becomes blocked or leaks blood. The effect is that tissue served by that blood vessel becomes starved of oxygen. Within a few short minutes, the region affected begins to die, and functions controlled by that part of the brain are lost or impaired. Uncontrolled high blood pressure is considered to be a major risk factor for a stroke. Other predisposing factors include diabetes, tobacco, obesity, and some heart irregularities. In a sizable number of cases, however, no obvious cause is ever identified. According to the Centers for Disease Control and Prevention, stroke is the fifth leading cause of death in the United States, with about 800,000 cases a year. Of those that survive a stroke, many are left with significant permanent disability; a percentage do not survive more than a year afterward. A blood clot obstructs a blood vessel that is needed to maintain circulation (“perfusion”) to the brain. This is called an “ischemic” stroke and is the most common type. Blood from an artery, vein, or an abnormal structure leaks into brain tissue or the space between the brain and the membranes that cover it. This can happen due to trauma, blood-thinning medication, or other causes, and is known as a “hemorrhagic stroke”. 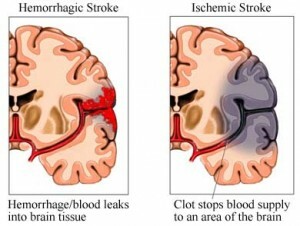 Sometimes, hemorrhage can occur in the area of an ischemic stroke, blurring the line between the two types. Thrombosis: A blood clot forms locally, causing obstruction. Embolism: A blood clot forms elsewhere in the body and travels through the circulation to lodge in the brain. Systemic Hypoperfusion: An inadequate amount of blood gets to the brain due to, say, severe bleeding, as in hemorrhagic shock. When blood leaks into brain tissue, it places pressure on sensitive brain cells, causing significant damage. 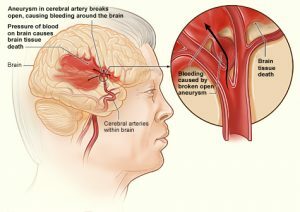 Hemorrhagic strokes can be caused by uncontrolled high blood pressure or, less commonly, by a malformation of a blood vessel known as an “aneurysm”. An aneurysm is a weakness in a vessel wall that looks like a tiny balloon; if it bursts, a catastrophic bleed into brain tissue can occur. Certain medications that suppress blood clotting may increase the risk of CVA. I mention this as a nod to my father, who survived a heart attack only to have a hemorrhagic stroke from blood thinners given to him in the aftermath. He died a few weeks later. In the brain tissue itself: This is known as an “intracerebral” hemorrhage and is the most common hemorrhagic stroke. Between the brain and the thin membranes that surround it: This type, albeit less common, can accumulate a significant amount of blood and cause severe pressure on brain tissue. 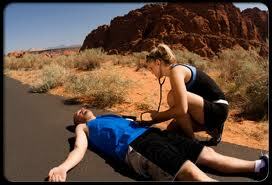 Occasionally, the medic may encounter a short-term event called a “Transient Ischemic Attack (TIA)”. Sometimes referred to as a “mini-stroke”, a TIA can present as minimal or significant symptoms, which are, well, transient in nature. In a classic TIA, symptoms will disappear for the most part within two hours or so. Despite this, it is impossible to know whether you’re dealing with a major stroke or a TIA when first presented with the victim. Those who experience a TIA, even if all symptoms disappear, will be at higher risk for a major stroke in the near future. Numbness or weakness affecting (usually) one side of the face, arm, or leg. Trouble speaking or inability to understand speech. Face: Smile. Does one side of the face sag? Arms: Raise both of the victim’s arms and see if one droops. Speech: Have the victim say a common phrase: Does it sound strange or slurred? Time: Call 9-1-1 right away if you notice any of these symptoms (of course, this won’t be an option off the grid). It’s important to note when symptoms started and when the victim was last seen well. The longer the time frame between wellness and debilitation, the more likely there’ll be long-term consequences. The presentation of a stroke victim is oftentimes quite striking and an observant medic will make the diagnosis quickly. Rapid action may help preserve function and even life. The majority of CVAs are ischemic in nature. In normal times, a patient with this type of stroke can be treated with a powerful IV therapy called tPA that helps break up clots (must be given within three hours). Procedures can also be performed that might be successful in removing the clot that’s blocking the circulation. In the absence of modern medical facilities, blood thinners like aspirin may be of use. If no aspirin is available, Salicin from the underbark of willow trees will have a similar effect. It should be noted that a hemorrhagic stroke may actually worsen with the use of blood thinners like aspirin. As many of these are caused by elevated blood pressures, anti-hypertensive meds may help to reduce damage caused. Blood pressure is usually at its lowest if the patient is placed on their left side. If caused by an aneurysm, surgical procedures may be necessary. Recovery from a stroke is not impossible. The National Stroke Association reports 10% will experience almost complete recovery, with another 25% with minor impairments. Reports suggest that most recovery occurs soon after a stroke, but improvement may still occur over a longer period of time, especially with rehabilitation. 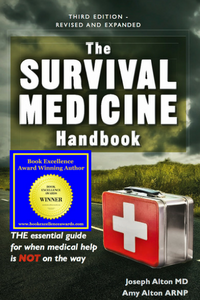 Learn about 150 medical issues and how to deal with them when the ambulance is not just around the corner, by checking out The Survival Medicine Handbook: The Essential Guide for When Medical Help is Not on the Way, available at Amazon or on this website.